Eva was my best childhood friend and we met at the age of three at the Male Street Kindergarten in Brighton in Melbourne’s south-east. 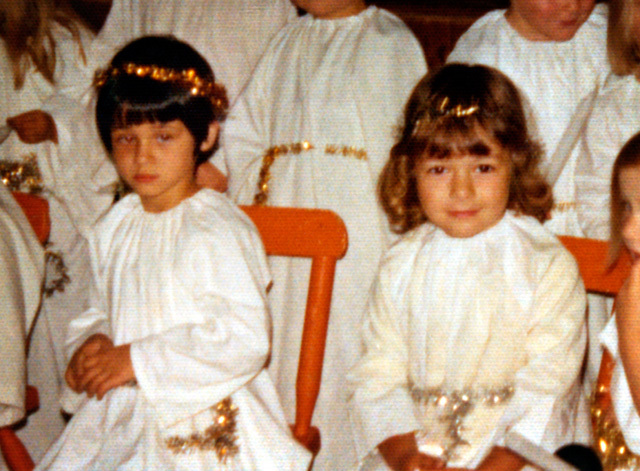 We were glued at the hip for a significant portion of our lives including our entire schooling years. Eva is Greek-Cypriot and she is a really good cook. Her mother Rebecca is a phenomenal cook who trained as a baker in Cyprus before she migrated to Australia. It was through this family that I was introduced to the joys of Greek food which is one of my favourite cuisines. Eva introduced me to the quintessential Greek lamb on the spit, tzatziki (cucumber yoghurt dip), dolmades (stuffed vine leaves) and pites (pronounced pi-tes, simply meaning pie) stuffed with cheese, leeks, meat and oh, my stomach growls at the memory. I happily ate Greek food in its most glorious and authentic form for years, including a trip to Greece in 2004. In my determination to eat moussaka and pites washed down with Mythos beer at least three times a day I managed to stack on several kilos in the space of one week. No mean feat. My Greek love affair went on until in 2006 I was diagnosed with a multiple food allergies, the main one being wheat, so it meant saying bye-bye to eating most Greek food as I knew it. Believe me I was not happy about it. 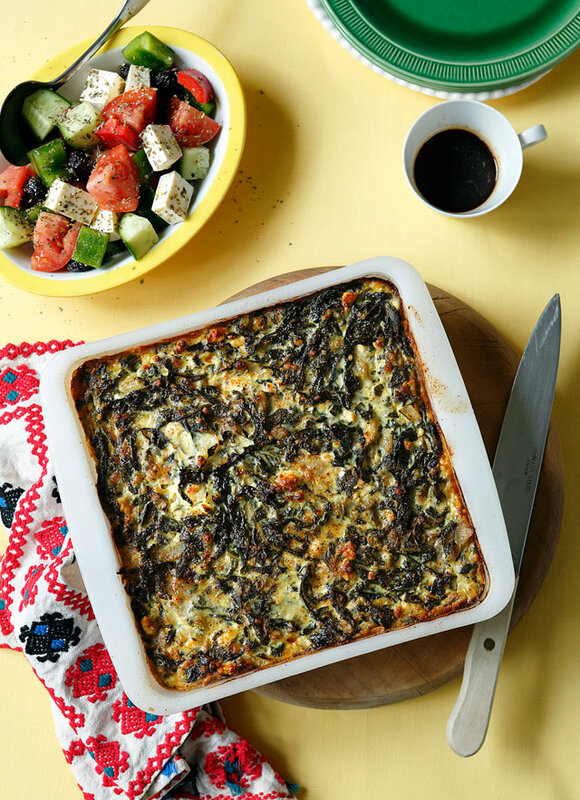 In the last six years I’ve often longed for the flavour that comes with spanakopita with the soft leeks and salty fetta so I created this, a frittata that has a flavour I believe to be very much like the filling of one. 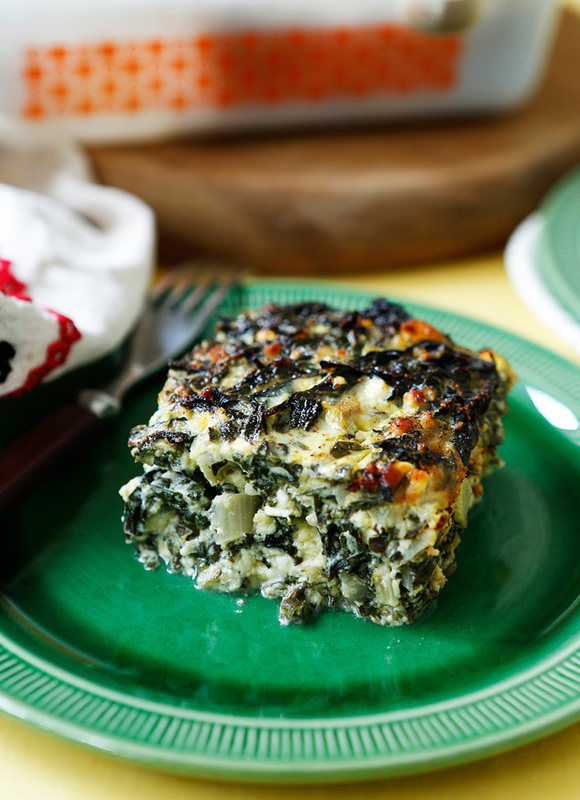 The frittata is perfect for a light lunch and I eat it regularly for breakfast. If you’re having it for lunch it would be improper to have it on its own so I’ve put together a simple traditional Greek salad to go alongside it just as they do in Greece. Prep time: 30 mins, cooking time: 45 mins. Makes one large 20cm square (8×8″) frittata. 1. Heat the olive oil in a large deep fry pan and add your onion, leek and garlic and cook until softened and transparent, approximately five minutes. Add the chopped silverbeet and stir fry until it is wilted, approximately two minutes, it will reduce significantly in size. Add the chopped mint continue to cook, stirring another five minutes. Set aside. 2. Preheat your oven to 180˚C (350˚F) In a medium sized mixing bowl add your eggs and lightly beat them. Add your milk, the two cheeses, nutmeg and half the cinnamon, stir until combined. Season with pepper only to taste (in my opinion the cheese has enough salt in it to season the frittata). 3. Add the cooked vegetables to the egg/cheese mixture and stir until combined. 4. Grease a square baking dish thoroughly (I used a 20cm/8″ size) and pour your vegetable/egg mix into it. Sprinkle the remaining half of the cinnamon over the top. Bake for 40 minutes or until centre of frittata is firm to touch. Let your frittata set for 5-10 minutes before cutting into it. It should still be quite moist yet firm in the middle. 1: Place all your vegetables and fetta cheese into a salad bowl and toss to mix them around. 2. In a small bowl combine your oil and vinegar by whisking with a fork or small whisk, pour over salad. Sprinkle oregano over the salad. As a firm believer of reduce-reuse-recycle, I make a point of putting my money where my mouth is in my day to day life and my work. All props in these images have been sourced from charity shops and council hard rubbish collections. The baking dish is a vintage Pyrex, the salad is an antique English bowl and came from Vinnies, the plates came from Salvo’s and the little Greek coffee cup came out of a box my neighbor put out for hard rubbish collection. The cloth and other bits were procured in a similar fashion, I can’t remember how. I just remember I had a lot of fun finding them. For readers outside of Australia, the two best known thrift/charity shops we have here are Vinnies (St Vincent de Paul) and the Salvo’s (The Salvation Army). Being Australian, naturally everything is shortened and nicknamed hence the abbreviated names.